Here's this week's Apartment Wanted post as I promised yesterday. Today, we're looking at rent-to-own apartments. If you're looking to become a homeowner but don't have the cash right now, rent-to-own may work for you. In most situations, a good part of the rent you pay is put towards a down payment on the house. You'll still have to secure financing and approval from your lender. I'm no money expert but I've heard that some rent-to-own deals can be kind of sketchy so make sure to read the fine print and take a more knowledgeable person with you if necessary. Gotta love Indy :) When I first saw this posting, I wasn't super excited about the outside of the house. 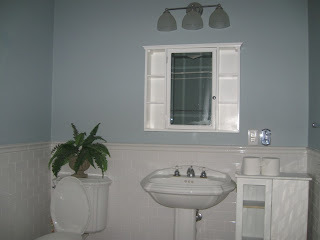 Then I saw scrolled down and saw the pretty bathroom with the gorgeous subway tile...my fave! The second bathroom has wainscotting. I'm not usually into lighter colors or girly accents but these bathrooms are just adorable to me. 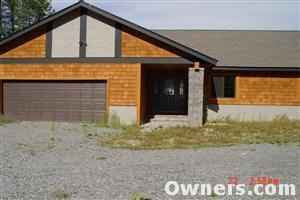 The fact that there's an attached garage and a hot tub doesn't hurt either! Financing options not disclosed in posting. Now you can tell all your friends you live in a penthouse! This top-floor apartment is move-in ready with exposed brick, hardwood floors, a balcony for entertaining, and a fireplace. There's also a jacuzzi in the bathroom. Cute starter home for a young couple. If you're an outdoorsy person, you'll love this home. Aside from it's warm, woodsy design, it's spitting distance from a golf course and has access to fun activities like snowmobiling and boating. When you're ready to come inside, you can relax in 2000 sq. ft of space. Nice. 50% of your rent goes towards your down payment should you choose to purchase. Some really great homes :) Renting-to-own is such a nice option - you don't feel like you're just throwing money away never to be seen again.